In 2016, our favourite kiwi lads Clap Clap Riot brought us their sweet 60’s inspired summer anthem Help Me, receiving raving reviews both in Australia and sister land New Zealand. With 2017 upon us, the surf-rockers have delivered us the second swash buckling single Tired of Getting Old from their third album Dull Life, set for release early 2017. Keeping good company, Clap Clap Riot’s forthcoming LP has been produced by Tom Healy (Tiny Ruins, Pop Strangers) and mastered by none other than Jared Hirshland (USA) who recently mastered the hugely successful Anderson Paak’s internationally acclaimed album Malibu, which scored a Grammy nomination for Best Urban Contemporary Album. In 3.38 minutes, Clap Clap Riot have truly captured the summer vibes on Tired of Getting Old with whistling hooks, fuzzy riffs and rollicking grooves. The up-tempo melodic gem has Brit-post-punk vocals and classic vintage keys that delivers that retro charm. While it’s remarkably a different flavour to the first single Help Me, it still maintains their signature sound, which demonstrates their diverse song writing ability. 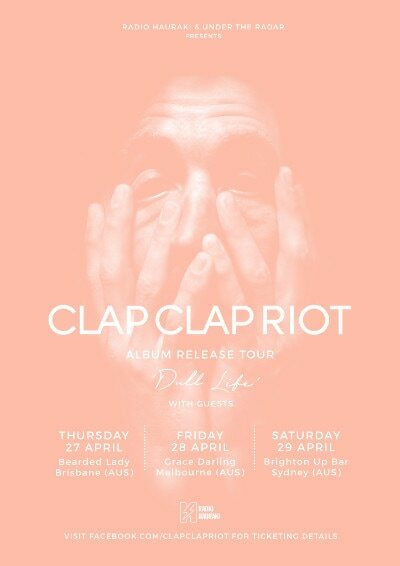 To celebrate the release of Tired of Getting Old Clap Clap Riot will be bringing their show to Australia’s east coast this April!